Most people, when asked what they want in life, know one thing for certain: they want to be happy. They may not know exactly what they want and they may not yet know their purpose, but they do know that they want a positive happy life. The good news is that a happy life is within reach. In fact it’s very, very close. A positive life is as close as your next decision. Truly. Good habits lead to a happy and balanced life. Happy is simple. A positive life is simple. In fact, most important things are like that. Simple… but not easy. Never easy… Always worth it! Your ticket to a better life, more love, and more success is only a decision away, and it begins with positive habits. So we’ve created a short—but significant—good habits list, to help you anchor your decision to live a better life. More than an actual list, these are conceptual habits worth implementing as a part of a healthy, happy, balanced life. These are expanded below, but in short, here are four pillar habits for a happy life. Daily creating – sets the momentum for success. Daily learning – keeps your brain agile and your business growing. Daily loving – love each day and the people in it and you will find joy. Daily movement – move vigorously, daily, for a vital vibrant life. 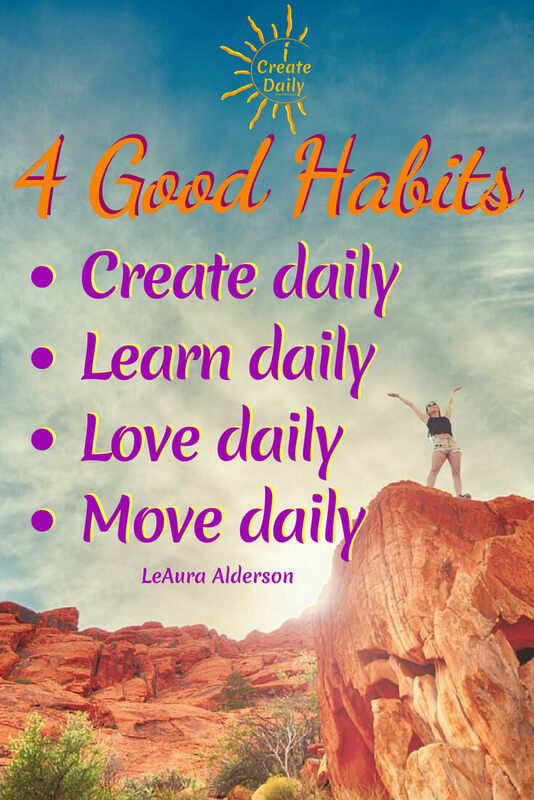 These four habits describe a way of life. They’re super simple, yet together they create a solid foundation for a happy, healthy life. Put these simple good habits to work for you and they will — work for you! Good habits create a good life and help you feel good about yourself. Happiness is actually so simple it can be missed. For a boost of inspiration and resiliency, you will definitely enjoy the Mel Robbins quotes and video in this article. Also, this other article which has a “success indicator” graphic, plus some great shareable memes and useful and inspiring information. Good habits are the foundation upon which a good life is built. Daily good habits are the bricks in the wall of success. Now, to elaborate on these four core habits that create a stable foundation for positivity and success. Create a positive day with simple but powerful good habits. Create Mindset – A positive mindset makes all the difference. Choose empowering positivity. Prioritize learning – Learn something new: tune into podcasts, videos, books, articles on topics that interest you. Pursue interests – What are you interested in? Commit to and schedule pursuing your interests. Discipline – Don’t let how you feel get in the way of what you want. Give the love you want to have. Gratitude – Start your day in gratitude – identify at least three things for which you are grateful. Kindness – Others you encounter are simply beings in need of love. Appreciate others—and yourself. Contribution – In helping others we help ourselves. Giving, helping and kindness connect us with divinity. Our bodies were made to move… so be sure to. Exercise – Start the day with brisk exercise, even if you only have a minute. Move – Move vigorously, walk briskly, do something vigorous that gets your heart rate up and deepens your breathing. Stretch – It’s your job to maintain your one body. Don’t neglect it and it will serve you well. If you still want more specifics, here’s nice long list of good habits. Imagine yourself at the end of a long and happy life. What blessings will you want to be able to recount? Visioning – create a vision board of the life you want to live, then set your goals to make it happen one step, one day at a time. For more in depth ponderings on good habits, you may enjoy this article. You can get a free download of a list of top success principles of fellow creators and entrepreneurs, here. Good habits build the dwelling of your life. A movement for creators serious about your art.